Transmit pure felicity to a buddy of yours by gifting the person this Daunting Blossoms in an Enticing Premium Arrangement and engrave a hearty spot in the person’s mind. 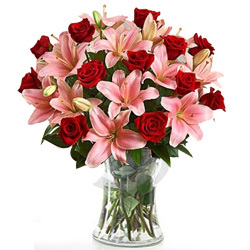 8 magnetic Pink Lilies and 8 inviting Red Roses sorted in a jaunty Glass Vase complete this Premium Arrangement. Transmit pure felicity to a buddy of yours by gifting the person this Daunting Blossoms in an Enticing Premium Arrangement and engrave a hearty spot in the person’s mind. 12 magnetic Pink Lilies and 12 inviting Red Roses sorted in a jaunty Glass Vase complete this Premium Arrangement.